Apologies: The Web Site offers it's apologies to it's regular viewers for the lack of up dates during August. It proved to be the usual 'low news' month plus we had little time ourselves due to other pressures. We hope to be back to more regular up dates now but we do rely on you keeping us informed about your forthcoming events ect. so please e-mail them in or drop them into Madeline our new Parish Clerk at the Village Hall office. Theydon Bois Viaduct: Jonathon Simmons of Epping Forest District Council has contacted me and asked me to update you on progress with the work to Theydon Bois Viaduct. As you are aware the first phase of the scheme to refurbish the Viaduct commenced last October 2002, this is the current work located on the carriageway under one-way traffic controls. The work has taken a lot longer than initially programmed due to rainier conditions than expected and extra work being added to the scheme. This phase of the work is due to be completed by the end of September 2002. The next phase of the work is to strengthen the viaduct on the Country side, this work will not involve any traffic controls on the carriageway (i.e., it will be carried out from underneath the structure). We are currently in the process of procuring the work and it should commence in late September or October 2002. Once the carriageway works have been completed we intend to issue a revised/updated version of the leaflet explaining the work to Theydon Bois Viaduct. I hope the above answers some of the queries in regard to this matter. Theydon Bois Music Society: The society starts it's new season of Concerts on Thursday September 12th at 8pm in the Village with a concert by The Vinteuil Piano Trio (Violin, Cello & Piano). It has concerts planned on the second Thursday of each month through to June. Membership is £27.00 p/a or pay at the door. For the full program for the new season Click here. Wansfell College: With the start of a new school year, now is the time to consider taking a course for personal interest or to learn new skills for work. The college offers a number of residential and day-school courses, and new this year, half-day computer 'taster' courses for you to sample the course before committing yourself to perhaps a longer exam based course. Some new courses have been introduced, and a number of courses may be of particular interest to local residents, for example, 'Essex History in the Landscape' and 'Natural History of Epping Forest'. Check out our website: www.wansfellcollege.net for more information or telephone 01992 813027 and ask for a prospectus to be sent to you. Friends of Copped Hall: The Friends of Copped Hall have also announced their Autumn program of walks and lectures. Click here for details. Theydon Bois Preservation Society: The walk on Sunday 8th September "Around the Village Boundaries" proved very popular with 22 people turning out, some having traveled some distance to attend. Even our new Vicar at St. Mary's , Colin Travers found time to attend between his morning and afternoon services perhaps the good weather and nice views inspired his evening sermon? The society's Chairman Peter Newton led the walk and was the usual mine of information on the history of the village and details of the listed buildings. The Society's next event on Friday 11th October at 8pm in the Village Hall is a talk on the Roding Valley Nature Reserve by Jenny Filby & Paul Cook. Jenny will talk on it's past as RAF Chigwell & Paul on it's present as the Nature Reserve. Admission is free and all are welcome. Spurs Development Model Letter: As noted below all the local Parish Councils and the Theydon Bois Rural Preservation Society are raising objections to this very extensive development. All objections will help prevent this development taking place. The Preservation Society have produced a "model" letter for download from this site addressed to The Head of Planing at Epping Forest District Council which is available for you to use if you wish. Just add your address and edit further if you wish. The letter was created in Word but should load into most word processors. 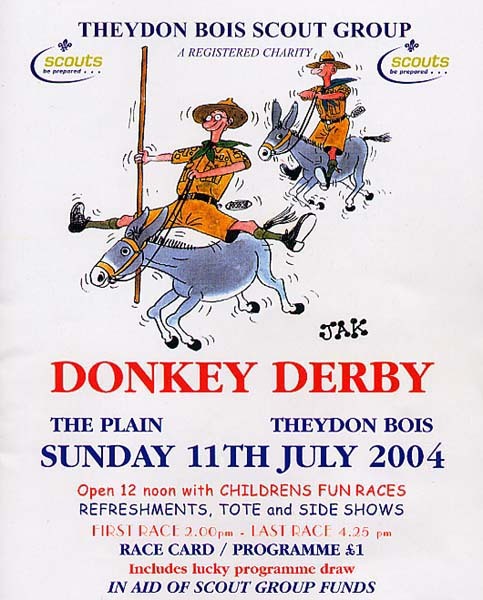 Sunday 14th of July saw glorious weather (one of too few such days so far) for this years Donkey Derby held on The Plain with the permission of the Conservators of Epping Forest and in aid of Scout Group Funds. 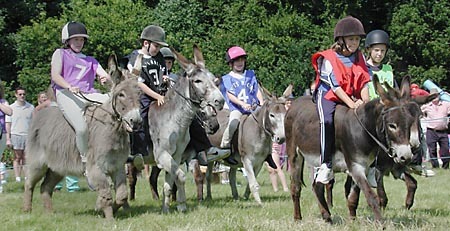 This was their 15th Donkey Derby since they began in 1988 and was one of the best with a mixture of the races with Tae Kwon-Do displays, Dance displays and all the usual stalls. Phillip Simmance was an excellent Master of Ceremonies and Race Commentator and had numerous humorous quips to to keep as amused while he juggled events to make sure everything ran smoothly and (near enough) on time. Some of the races were great fun even if the riders of all the ones I backed seemed to have trouble keeping in contact with their mount. We have more pictures of earlier Derby events in the Photo Galleries. Village Preservation Society AGM: Theydon Bois & District Rural Preservation Society held it's Annual General Meeting on Friday 12th July in the Village Hall, nearly 50 members attended. The meeting it's self was proceeded by a very interesting talk given by the R.S.P.B. 's Dr. Guy Anderson entitled "The Decline of Our Farmland Birds. How we can get them back". Dr. Anderson indicated with the help of data slides and many wonderful bird photographs how the changes in farming practice together with other factors brought about a sever decline in our bird population in arable land areas over the last thirty years. He also showed how the RSBP working in partnership (rather than in confrontation) with local farmers in Countryside Stewardship schemes ect. had managed to help reverse this decline with certain species. There were many interesting questions from the floor which were only cut short by the lack of time and Dr. Anderson was seen to be answering many more. At the AGM that followed the Society's Secretary, Mr. Eric Thurston read the minutes of last years AGM and Chairman, Mr. Peter Newton thanked all of the officers for the contribution they had made over the last year. He then vacated the Chair so that the election of this years Chairman could take place. Mr. Newton was nominated and reelected again for this post unopposed. Mr. Geoff Haslehurst was nominated and elected unopposed for the post of Treasurer, a post that Vice Chairman Mr. Martin Boyle had carried out as a dual role last year. The Chairman said that the present committee were all will to stand again and these were reelected on block. Further details can be seen on the Preservation Society Page. Tottenham Hotspur Football Academy: You have probably seen by now the leaflet from the combined Parish Councils of Theydon Bois, Theydon Garnon, Theydon Mount, Lambourne, Stapleford Abbots and Stapleford Tawney with regard to this massive development over a site of 60 acres in Theydon Mount only accessible by the narrow Epping Lane. All of the Parish Councils are opposing this development which is in what is normally considered Green Belt Protected land because of it's huge environmental impact and implications for increased traffic through all our villages. At the AGM of the Theydon Bois Rural Preservation Society a motion opposing the development was proposed and was passed unanimously but just because all these bodies oppose this development it does not mean that it will not be given the go ahead in the present climate. If it goes to appeal every individual objection will count. Village Anti-Social Behaviour: Theydon Bois Vandalism & Anti-Social Behaviour Action Group. WHAT ARE WE??????? 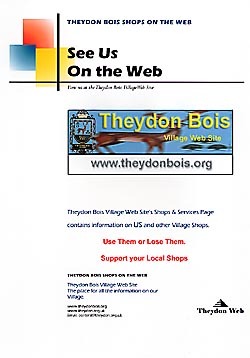 Our Aim..to help make Theydon Bois as Crime Free, Safe and as pleasant a place to live and work as possible. We are a small group of unpaid mixed aged Theydon Bois residents that have volunteered to help the Police, Epping Forest District Council and Essex County Council to fight Vandalism & Anti-Social behaviour in Theydon Bois. The group has been formed as a result of the Crime and Disorder Act and is under the umbrella of the Theydon Bois Community Safety Group. As a group we will meet on a regular basis to discuss with police and others what we can do to achieve our Aims. We will try to obtain funding from Government or other sources to benefit ALL in Theydon Bois. Our meetings are recorded and available for inspection. We report to the Theydon Bois Community Safety Group. We will try to work with all of the partner agencies e.g. Police, Youth Services, Local Authority, Local Businesses, Residents, Parish Council indeed any organisation or group that has our aims in mind. That is to make Theydon Bois as Crime Free, Safe and as pleasant a place to live and work as possible. It was originally suggested that the group be called the Vandalism and Youth Antisocial behaviour group. The group immediately recognised that not all of the anti-social behaviour was caused by the YOUTH. Yes shocking, as it may seem us grown ups do some really thoughtless and Antisocial things!!!!! Adults as well as the Youth in the village will be asked for their opinions and we may ask for your help. With your help and understanding we hope to make what is a wonderful village into an even better one. This will not happen over night; indeed some things may take years, but try we will. We will keep you informed of any progress. I can be contacted via the Parish Clerk (Frank Jones) at Theydon Bois Village Hall. In July of last year it was brought to the attention of the Parish Council and the Web Site that trade was being lost and livelihoods put at risk as people shoped elesewhere for goods that could be obtained for the same price in the village shops, the result of this would be that we would all suffer. Since July we have seen further closures. Coming Events: If you visited our village for the Open Gardens Day (see below) and enjoyed yourselves then we have two further events coming soon that while quite different are equally enjoyable. Open Gardens Day 2002: Sunday 30th June 2002 again proved to be a lovely day to visit the gardens of Theydon Bois. Despite predictions the rain held off until well after the event and we were indeed blessed with sunshine for most of the day. Seventeen gardens were open for viewing from 11am to 6pm on this the 22nd year of this event. We again we saw large numbers of visitors, some from very far afield, touring some of our village's most beautiful gardens and this in spite of competition with the World Cup Final! Joy Wainwright, the ticket sellers, information and direction givers, those who transported visitors to the further reaches of the village and many others all who put in a lot of hard work to make the day successful yet again. A special thanks should go to all the volunteers who provided the much need refreshments who seemed run off their feet at times with the demand. We talked to visitors who come year after year as they enjoy the day so much and when it came to 6 0' clock many seemed reluctant to leave without squeezing in one more garden visit before next year! We will have a full report on the day in the near future but we do have photos from some of the gardens open this year. Click Here, last year's pictures are also still to be seen from our Photo Galleries. St. Mary's re advertise for New Organist and Choirmaster: St. Mary's are still keen to fill this post in our beautiful church. Please apply as below or pass the information onto anyone who maybe interested. We now have the report of the Thursday 30th May 2002 Parish Council Meeting. Click Here. This is to advise you of a change of policing style that takes affect within the Epping section from Monday 13th May 2002. Unfortunately the current system of one named community officer allocated to each individual beat does not provide the flexibility required to meet the demands of current community policing. The reality is that one officer only works on average 8 hours a day, five days a week for approximately eleven months of the year, when restdays and holidays are taken into account. That officer is trying to be all things to all residents and there is not the time to physically meet the demands of the communities we serve. All my officers are currently working within these constraints and therefore there is little time to effectively target 'quality of life' issues. From 13'h May 2002 by team will be divided into three teams. The 'Community Link Team' will work out of Epping and cover the whole of Epping Area. Officers have been allocated to larger areas but will act as links' to Parish Councils, community forums, primary schools and other community organisations and the community at large. Although they will take records of incidents they will not be responsible for investigations or the burdensome paperwork that takes them away from the community. This team will also provide the 'staffing' for the Rural Police Office. There will be two 'Problem Solving Teams', working from Ongar and Waltham Abbey but they will cover the whole section, acting independently as two teams or if necessary, as one large team. They will work directly with the 'CLO's and target issues of concern identified by the 'CLO's. These will come from their jnter-action with the communities plus intelligence gathered from other sources. The teams will then target those areas identified as suffering particular problems or known individuals causing nuisance or committing crimes. I will now have a 'pro-active' arm able to address some of the longer-term issues causing concern for you and your residents. The cost will be that some of you may loose your existing allocated, named local officer. This should not be interpreted as a loss of resources or disinterest on our part. They will be replaced with a named 'Community Link Officer' with the support of a team of ultimately 14 'pro-active officers'. When not engaged in targeted patrols they will be engaged in high visibility patrols across the section. In addition, as announced in the media, we are currently looking to extend the use of the Rural Police Office to later in the evening. This will increase the 'reassurance' value particularly to some of the rural areas not currently covered. These changes do not affect the existing system of 'response' policing across the section, which is maintained 24 hours a day, seven days a week. In an emergency, callers should still dial '999'. Routine matters are still to be routed through the general switch board - all local police station numbers are now routed through the main switch board at Harlow Police Station - 01279 641212, what ever number you dial. who can be contacted at Epping Police Station or by telephoning the Harlow switchboard and asking for Epping Community Policing Team. THE QUEEN'S GOLDEN JUBILEE: Without doubt, the recent celebration organised by Peter Simmance and his committee to commemorate the Queen's Golden Jubilee at the Primary School was a resounding success. It was a magnificent day. I have heard nothing but praise for the event which rekindled some of the spirit of yesteryear. A wonderful achievement. Peter volunteered to organise the Jubilee event on behalf of the Parish Council so, on behalf of all Councillors and villagers who so obviously enjoyed the day, I would like to thank Peter for all the brilliant planning, preparation and execution of the day's celebrations. The Parish Council's gratitude is also extended to the committee and all involved in the final preparations and afterwards, the cleaning up, for all the hard work in making this celebration happen. A special mention must also go to the Compere for the whole event, Phillip Simmance. It was no mean feat to keep going all day. A very big thank you to him. Theydon Bois Horticultural Village Show: Don't forget or miss out on this village show for all the family. The show is on Saturday 27th July, 2.15. in the Village Hall . Show schedules are available from Mrs. Turner 812652 or Mrs. Haslehurst 812177. This is our first show in the new village hall. Please help make it a special occasion. Entries are welcome from all the family and there are sections for handicraft, wine cookery, photography as well as flowers , plants and vegetables. Please make an effort to support your local village show. See you on Saturday 27th July. 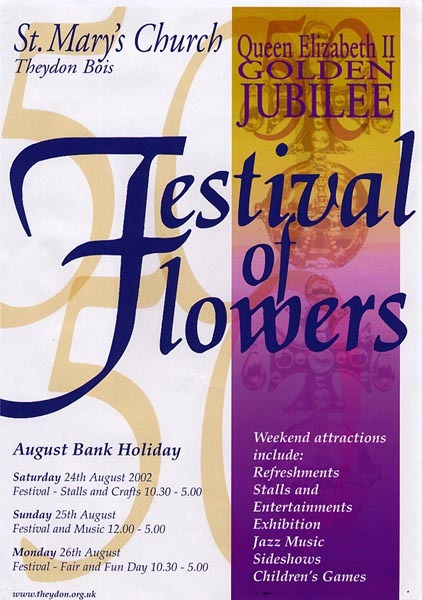 St Mary's Church is holding its three day Flower Festival during the August Bank Holiday weekend : Saturday 24th, Sunday 25th and Monday 26th August. The theme is the celebration of Her Majesty's Golden Jubilee and the floral exhibition has the title 'God Save the Queen' The Life and Times of Elizabeth II. On the Saturday and Monday there will be a large variety of stalls in the Church Hall grounds and refreshments will be served every day. The Church will be open from 10.30 am (12 noon on Sunday). Organ music will be played in the Church daily and a jazz group will play in the Churchyard on Sunday afternoon. I was still a schoolgirl then you see. Yorkshire, Cornwall and the sea was blue. For wine, so all could drown their woes. That lovely sand and sea and space. To help our country to get through? As thistles can be very rough. Although I'm sure we left a few. You'll never get potatoes to grow. Nothing will grow in that poor soil." We proved them wrong after much hard toil. How gratefully we harvested our crops. We really felt we were the tops. Now if you don't believe its true I've got a photo to show you. My friend and I in forty one Working in Cornwall and spuds by the ton. By now, most if not all of you must have seen the articles and pictures of the new Jubilee Garden recently opened by the Parish Council Chairman Wilf Shales. For those of you who have not seen the new garden it incorporates a simple but attractive formal design of paths round pea gravel filled areas planted occasionally with box. In the middle of the garden is a small round bed mainly planted to box with a stone bird bath feature. Opposite this feature and to both sides are stone benches. At either end the garden is flanked by two large round beds incorporating trees, shrubs and plants. A substantial trellis planted with climbing roses and other plants provides a frame for the garden. The trellis is designed to give an attractive backdrop to both the new garden and to the traditional burial area which was always a bit bleak. Hopefully, once all the plants have established themselves the garden will mature into a secluded attractive area bordered by lovely flowers and shrubs. The pea shingle areas are reserved for future requirements over the next 20/30 years for cremated remains with the associated commemorative stones. It is intended that this area is a place of solitude where relatives can go to sit, be near their departed loved ones whether they are buried or cremated, reflect on happy memories together, a sanctuary for reflection and prayer. For those of you who are interested from the horticultural point of view, the planting plan represented a major challenge. The enemy, the rabbits! Many specimen plants supposedly rabbit resistant were experimented with. Below is a complete list of plants planted. Betula utilis var. jacquemonti; Amelanchier 'Ballerina'; Buxus sempervirens; Cornus alba 'Kesselringii'; Ajuga reptans 'Catlin's Giant'; Ajuga reptans 'Atropurpurea'; Alchemilla mollis; Bergenia cordifolia; Geranium 'Johnson's Blue'; Hemerocallis 'Catherine Woodbury'; Memerocallis 'Summer Wine'; Pulmonaria ruba argantea; Pulmonaria saccharata 'Dora Bielefeld'; Pulmonaria saccharata Group; Rosmarinus officinalis; Vinca minor 'Atropurpurea'; Vinca minor. Roses: Souvenir De La Malmaison; Iceburg; Mme Alfred Carriere; Zephirine Drouhin; Constance Sry. Spurs Sports Academy See the plans. Consider the consequences. Two public meetings Monday 8th July and Tuesday 9th July 7.00 PM Abridge Village Hall. The Parochial Church Council has determined that actual demolition of the damaged vestry and construction of the new extension should commence in September 2002. This will be six years after the original appeal. We believe that even this is an act of faith because we have about £325,000 actually in hand against £425,000 estimated costs and in order to achieve the September start date we would need to enter into a building contract around July. Some further income is projected, but on the recent dimension of giving, St. Mary's could be £75,000 short. The PCC believes that if this amount cannot be made up by July we shall have to defer further (during which period costs may rise) or reduce substantially the specification of the works. This would be very sad. We cannot over-emphasise the importance of this 'final' drive for financial support. St. Mary's is a fine GradeII listed building; it is we believe a credit to this village in spiritual, historical and architectural terms. The improvements that should arise on all these fronts from having a major purpose- built extension at St. Mary's will be very significant for us all. Would you please help us now. New Vestries Appeal: Contact Appeals Treasurer, Alan Mathews Tel: 01992 813376 or Richard Risdon - Project Chairman Tel: 01992 813724. Induction Service for St. Mary's New Vicar: The new vicar of St. Mary's, Revd. Canon Colin Travers, Institution & Induction service is on Tuesday 6th August at 8.00pm. The service will be taken by the Rt. Revd. John Perry, Bishop of Chelmsford and Ven. Peter Taylor Achdeacon of Harlow. Advance Information on Events at Wansfell College: We have received the following information from the friends on some of the events later in the year at Wansfell College. We will add them to the Diary Page closer to the dates but you may wish to book now for these popular events. Garden Party, organised by the Friends of Wansfell College, in the College grounds on Saturday 13 July from 2pm to 5pm. All are very welcome. There will be stalls, sideshows, raffle, tombola, etc. Delicious home-made refreshments will be available all afternoon. This is also a good opportunity to explore the lovely garden. Admission only 50p. To be held in the college if wet.